Meghan decided she wasn’t going to let anything rain on her and Michael's parade, not even rain itself. After all, some folks say rain on your wedding day is good luck! Grab your poncho and read on to learn more from Meghan. Cliche as it may be, I knew the moment I met Michael that he was different. He was an incredible listener, a wonderful friend, and the perfect man. Only one problem, he had a girlfriend. Unlucky for her she was a bad person and cheated on this wonderful man, leaving him for the taking. Not long after that our love story started with dinner, then led to talking into the wee morning hours. Fast forward 4 years, per usual my wonderful boyfriend had planned another surprise birthday party for me. This year, I was expecting a proposal, but to my surprise, it didn't happen. Yet. The very next day he got down on one knee and asked me to spend the rest of my life with him. 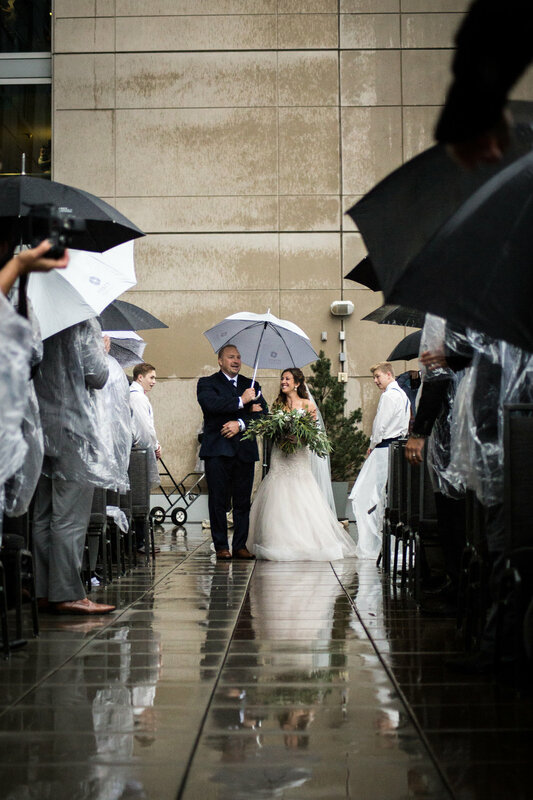 One year and a little over one month later we walked down a soaking wet, rainy rooftop in downtown Denver to exchange our vows in front of our 200 closest friends and family. (Don't worry, we gave them ponchos). The love we have for each other and our friends inspired everything. Every decision we made was to ensure everyone had a fabulous evening they would never forget. We had minimal but beautiful decor that was light and organic. The most important part of the evening was the experience. From the specialty tequila bar to the late night pad thai in adorable mini Chinese food boxes! HAHA I wish I could say something else here, but... We didn't cut a single corner when it came to making the experience perfect. I did, however, cut costs when it came to decor and all the things I realized I couldn't recall from past weddings I'd been to. We enjoyed amazing pre-wedding yoga on the rooftop terrace where the ceremony would be held later that day. The practice was centered around staying grounded and present in the day. Did I mention, the sun was out? By all accounts (historically speaking) you couldn’t ask for a more perfect day. In fact, there is a only a 15% chance that more than 0.04 inches of total precipitation will fall in Denver throughout the day on September 23. But mother nature had a different plan for our day. I could have very easily let this ruin my day, after all what bride wants rain on her wedding day? But early in the day, I made my mind up that I wasn’t going to let anything rain on my parade, not even rain itself. 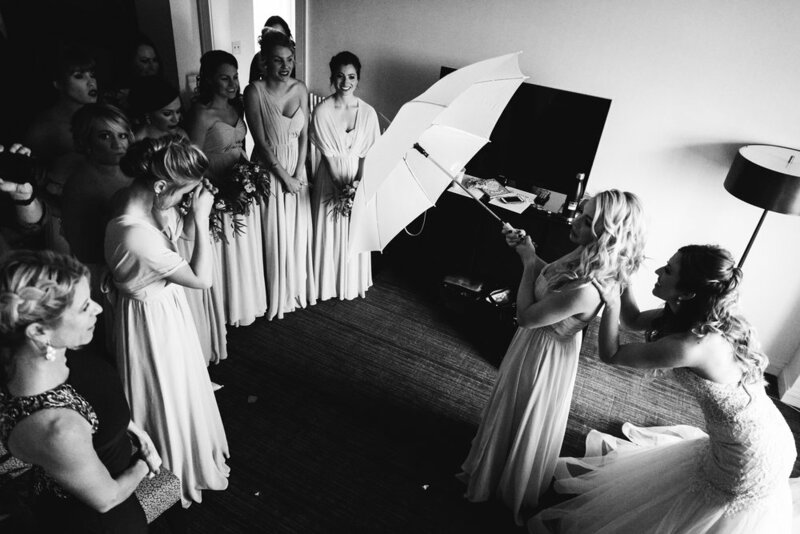 I was blessed to be surrounded by the most amazing women and bridesmaids. They lifted me up in so many ways, I’m sure there are things that I don’t even know about to this day. That said, there was a moment that changed it all. 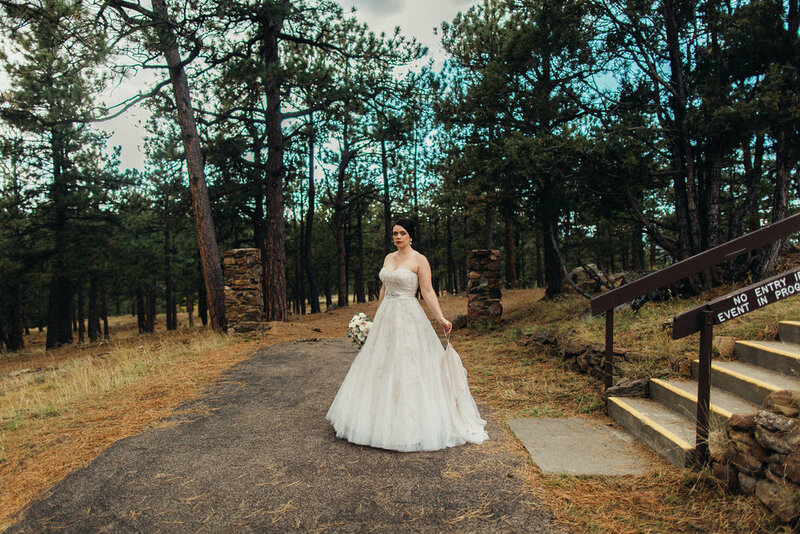 We were about 1 hour away from the ceremony starting, my dress was on, my hair and makeup were flawless thanks to Candace at Dotted with Hearts Artistry and Lauren Shea at Lauren Shea Wedding hair, my amazing family and friends were surrounding me, but in that moment, it was still raining. There were so many things happening around me and all of the sudden it all rushed over me like a wave. 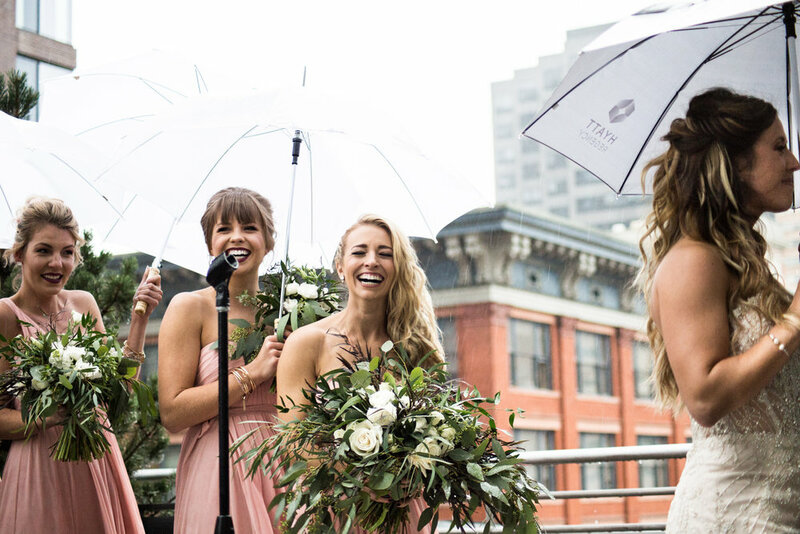 I’m asking 200 people to sit in formal wear, on a rooftop, downtown Denver, in the rain. I immediately reminded myself to stay grounded, calmly made my way to the window looking down, longing to just put my feet in the grass, to ground myself. But, I knew that wasn’t an option, so I sat by the window and cracked it the whole 2 inches that you are allowed in the 34th floor. Suddenly, I was met with an all to familiar smell, Petrichor otherwise known as the smell of the earth after it rains. In that moment, I knew everything would be okay. 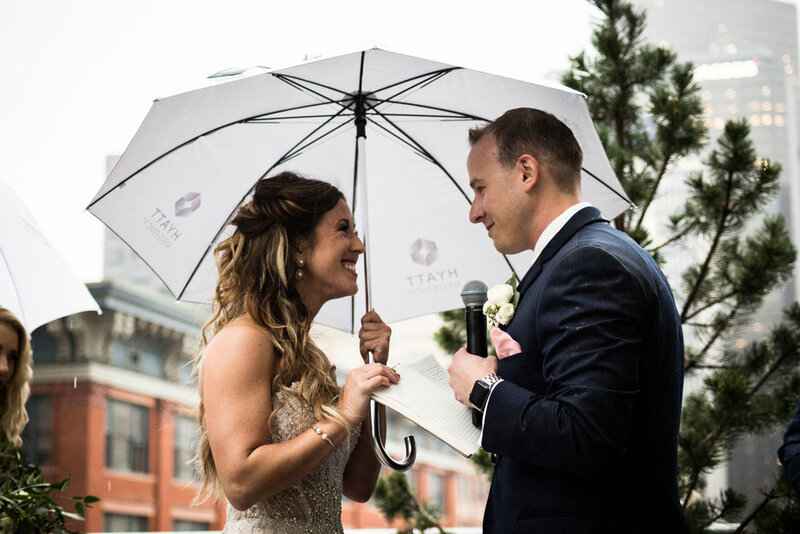 I was marrying my best friend and that is what the day was about, rain or shine, I got to stand and profess my love for the man of my dreams in front of all the people near and dear to our hearts. Well it rained, and thank God for Amazon... can you say Ponchos? I've recently ventured into starting my own business as a wedding planner. Thus, I could go on and on and on. But honestly, every event will have its flaws. You just have to make sure that you remember what the wedding is really about. Two people who love one another, professing their love in front of their loved ones. Always remember, you're on the same team. 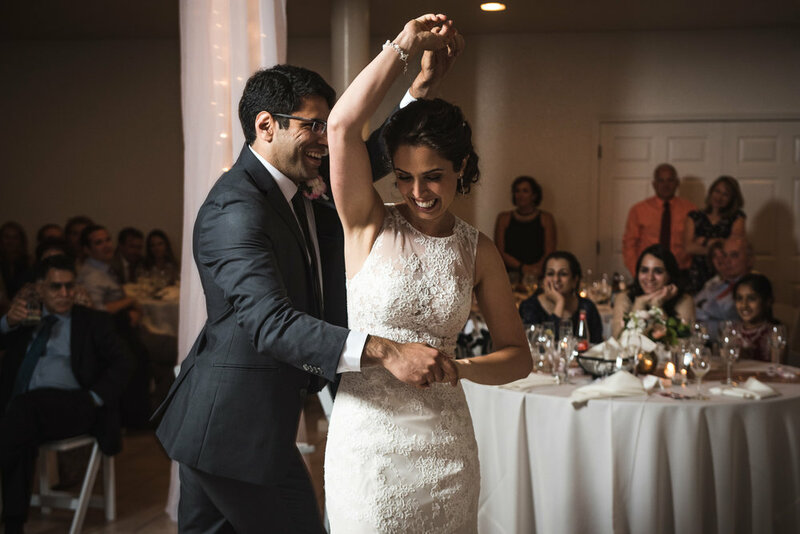 Christina and Adnan shared an unforgettable year of wedding celebrations, honoring their families' cultures every step of the way. 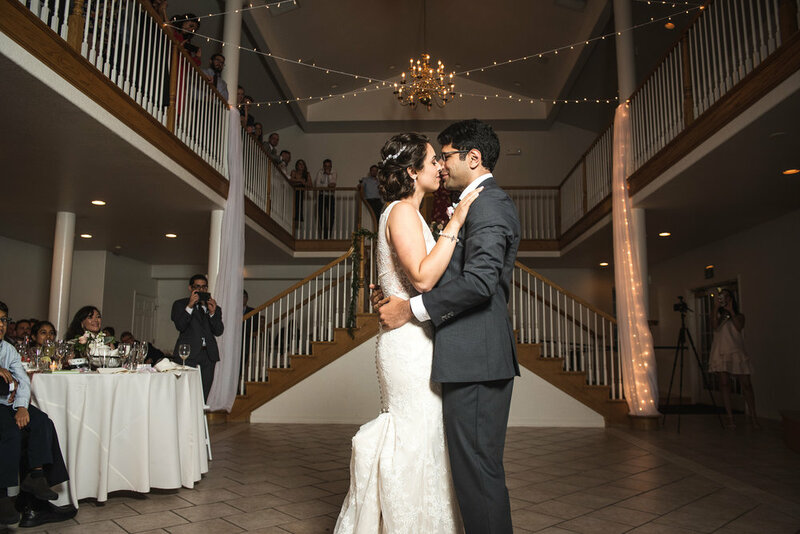 They beautifully displayed how love transcends cultures with an Islamic ceremony, a Colorado mountain wedding, and Indian reception. Read on to learn more from Christina! We were both teachers attending a professional development session and were asked to role play students so teachers could practice classroom management. My student profile said to behave perfectly. His said that he "is enamored of the person sitting next to him" - and he did an excellent job flirting with me. The role play flirting turned into a wonderful friendship, which turned into dating. 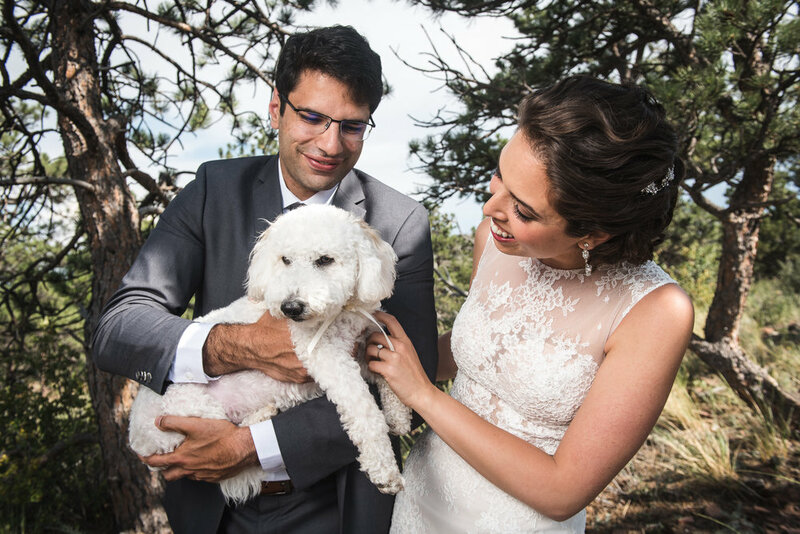 Adnan proposed to me in my hometown, Boulder, and we began our beautiful year of wedding celebrations and blending our two families and cultures! We had our Nikah, our Islamic legal wedding ceremony, in a mosque in Chicago - it was a colorful, joyful two days! Following that celebration, we hosted our family and friends for a Colorado mountain wedding where we were married by my family friends in my favorite place in the world. 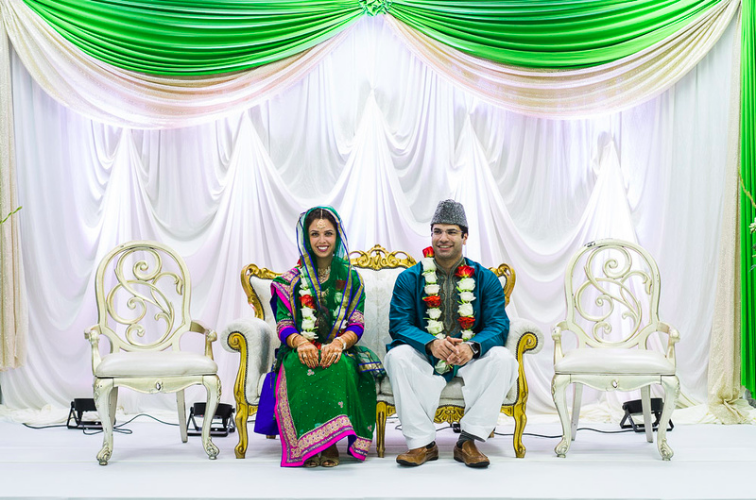 To round out the events, Adnan's parents hosted a Walima, a beautiful Indian wedding reception with their incredible family and community. 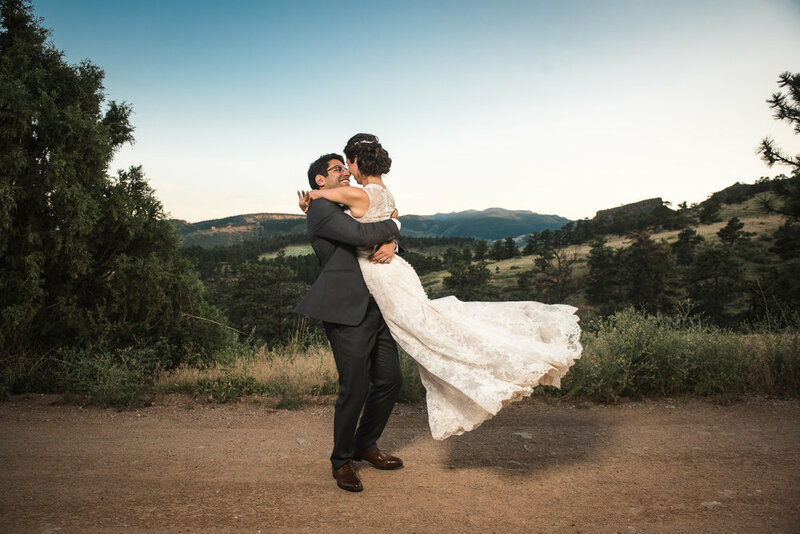 Our Colorado wedding was designed to be a joyful, timeless, and beautiful coming together of our families and friends. It was important to us that our families be at the center, so our wedding party was our siblings, and family members made heartfelt toasts. 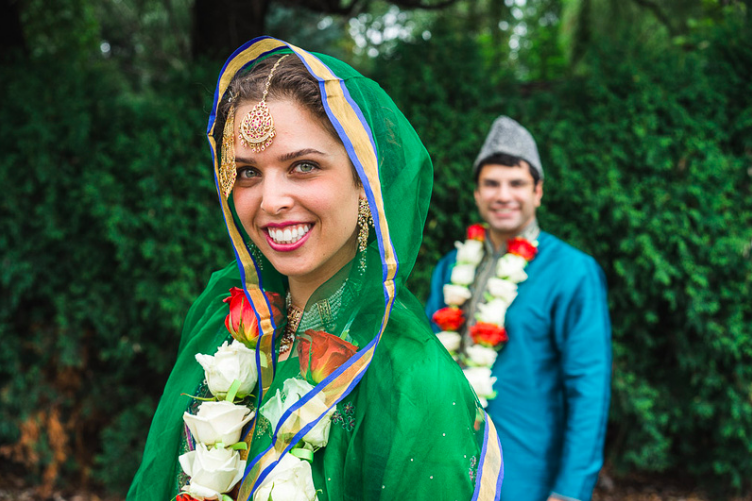 When designing the ceremony, we carefully considered the differences between our families culturally and religiously, and the shared love and values that transcend any differences. We wanted to craft a ceremony with our family friends who married us that would uniquely reflect us, our values, our personalities, and our families. 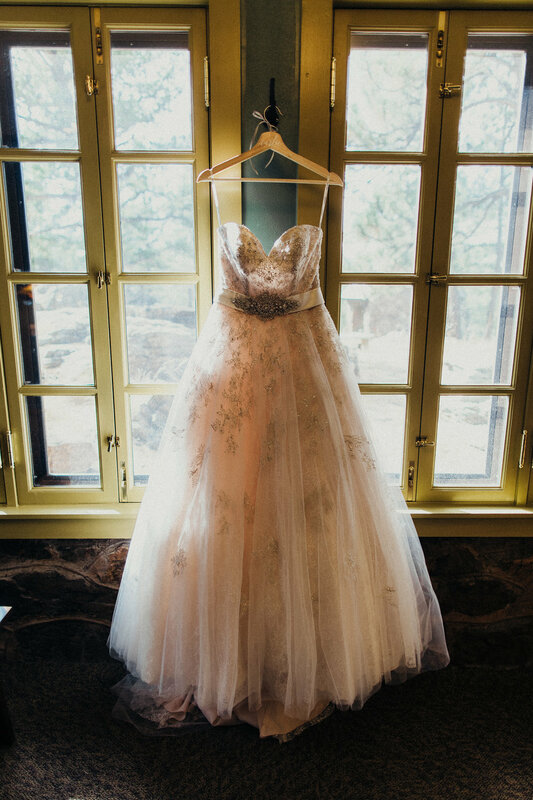 The colors were all inspired by the natural beauty of the Colorado mountains - the light pinks and greens evoke the natural landscape around us. 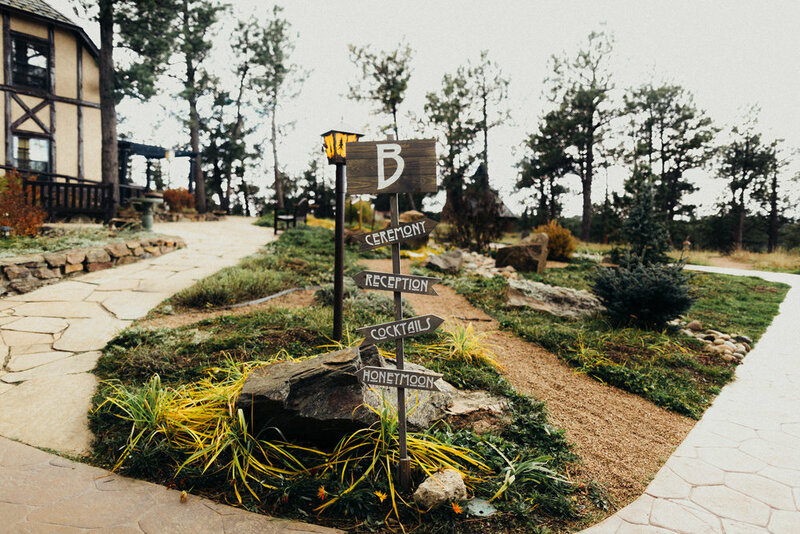 We wanted to be able to see mountains from our ceremony spot, we wanted delicious, local food, and we wanted to have fun dancing - and we were able to make it all happen with our venue! One of the conversations we had when we were budgeting was to name what was most important to us - and we decided to pay for quality and go with our preferences in those categories. We knew we wanted excellent photos since those would last beyond our day and we wanted delicious, local food for our guests. Our ceremony spot was so beautiful, we knew we didn't need a lot of extras to make it special - so we opted to cut costs on things like programs, chair decorations, and so on. Adnan and I met in Nashville, Tennessee, and we wanted to have a nod to our meeting place and our friends we made while living in the South. Therefore, we had some late night snacks of Chicken and Waffles as well as a S'mores station. Our ceremony was incredibly special to us; we worked together for a year with our family friends to craft the content and flow. Adnan and I chose readings - a more serious one and a light-hearted one - that were non-religious and encompassing of our personalities. We loved having a Polaroid camera for guests to take pictures and leave us photos + notes in our guest book. After we got engaged, we adopted Teddy, our energetic and adorable puppy! We loved that he could come to see us before the ceremony, handsomely sporting his Dog of Honor bandana. There are so many little moments that stand out to us as we reflect! The two brightest spots in our minds are first, when we took five minutes just to be together after the ceremony but before we entered the reception. We climbed up to the third floor of the venue and peered down at all of our guests during cocktail hour and just took a moment to be grateful for all our family and friends - and relax for a moment! The other favorite moment was our first dance. We had taken lessons and were incredibly nervous and excited. We loved the energy of our guests during our dance, and felt like we were the only people in the world. A couple of challenges we faced during the wedding planning process included planning from a distance - we are currently living in California - and imagining and designing a wedding in which both of our families feel represented, included, and comfortable. My family and friends who were local in Colorado - as well as our amazing vendors - made it easy to hop on FaceTime or email back and forth in order to plan! I loved how Lionscrest Manor (our venue) had worked with so many of the vendors before, they were all so comfortable and knew the routine. 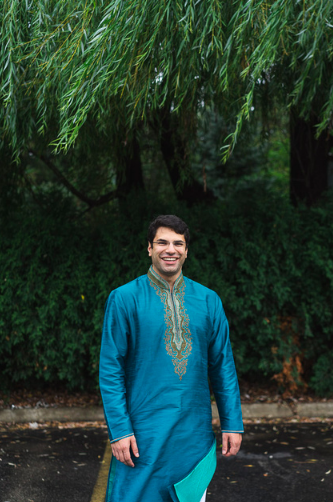 I'm so glad that Adnan and I had a year to plan out our wedding that would welcome the families together; it was so important to ask everyone what they were comfortable with, how they wanted to be included and celebrated, and just to have frequent communication. Read more on planning a wedding from out-of-town here. Looking back, I wish that we had booked our venue for a little more time - it goes by so quickly! I did my hair and makeup off site, and wish I had a few photos of everyone getting ready. By the time we had gotten to the venue, we only had about 30 minutes before photos started. Another thing I learned was that it is okay to have a preference and to ask for help! I was very relaxed and did a lot myself, which was lovely! Some of my friends and family really wanted to help, and I was just as relaxed and happy delegating, so I wish I would have done that earlier. Also, I wish we would have opted to have our photographers stay until the very end! Decide what is most important to you, and pursue quality! Remember that it is your day, and you should honor your preferences and wishes. Make sure you feel comfortable with your day-of coordinator and communicate frequently with that person! Take time to be with your significant other at some point during the event - just the two of you. Enjoy it - it will go by so fast and you want to be really present the whole time! Communicate frequently and honestly by sharing your needs and wants - and listen well! Continue practicing or discover how to show love in ways that matter to your partner. Date each other, even though you're married. Have each other's backs and keep being each other's best friend. Follow your own timeline and life path, and know that doing that might not make everyone else in your life totally happy. Wedding planning was one of most stressful, but ultimately rewarding times in Maggie and Daniel's lives. The most important advice they kept in mind on their wedding day was, "Look around you and be thankful. There is likely never going to be another moment in your life when all of these most important people are in the same place, at the same time again." Read on to learn more from Maggie and Daniel! 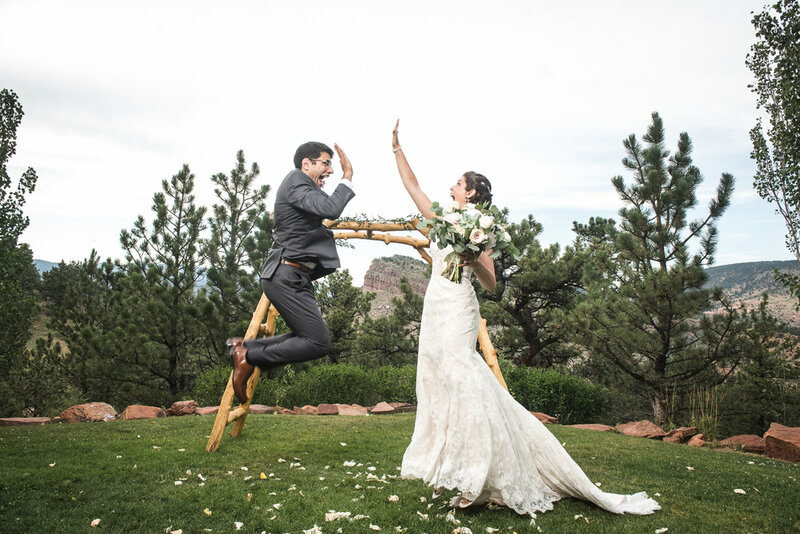 Daniel and Maggie met on a warm summer night in Boulder. What started out as a gradual courtship eventually developed into a whirlwind romance. 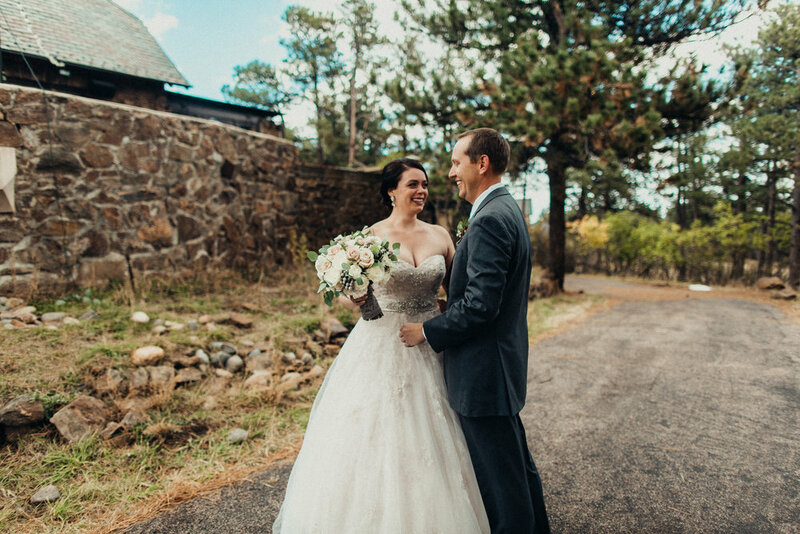 With a shared love of simplicity in life and the importance of family, Dan and Maggie built a solid foundation in Christ before gifting their lives to each other before an intimate group of close friends and family at St. Catherine of Siena Chapel, known as the Chapel on the Rock, outside of Estes Park. It all began with the chapel. When Maggie moved to Colorado in 2007 with just a broken heart and her dog, she rounded the corner in Allenspark, on the way to RMNP, to a stunning stone chapel perched on a rock at the base of a towering mountain. She never made it to RMNP that day, instead hiking around the chapel and praying that someday the Lord would bring her to the altar in that chapel. 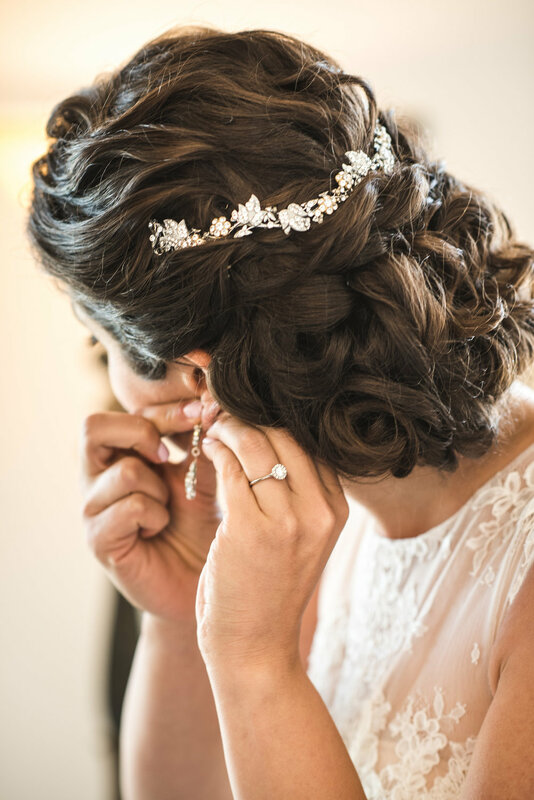 10 years later she was walking down the aisle of St. Catherine of Siena Chapel to commit her life to the man God had finally brought into her life. With such a magnificent backdrop for their wedding, Maggie and Dan knew it was the perfect setting to incorporate a simple theme, with neutral color palette and classic detailing. Baby's breath, with its beautiful, delicate flowers, was the foundation from which the color palette was built. Classic ivory, sage green and light beige with subtle hints of blushing pink were incorporated to create a soft, romantic palette. Maggie wore a corset-backed, ivory lace wedding dress, lined with blushing pink satin to complement her fair skin and red hair. She altered the dress, adding matching lace cap sleeves to honor the traditions of a Catholic Mass. Dan wore a simple black suit with a white dress shirt, black bowtie, and black vest with Fleur de Lis cufflinks as a nod to his New Orleans family ties. To balance Dan's look, Maggie's four bridesmaids each wore their own, unique black dresses while the groomsmen each wore their own, unique mix of light and dark suits. Maggie and Dan chose to complement the baby's breath with roses and eucalyptus. The ivory colored roses elevated the romance and kept the look classy and traditional while the eucalyptus incorporated a beautiful sage green color, unique texture, delicious scent, and height contrast to the centerpieces and chapel accents. 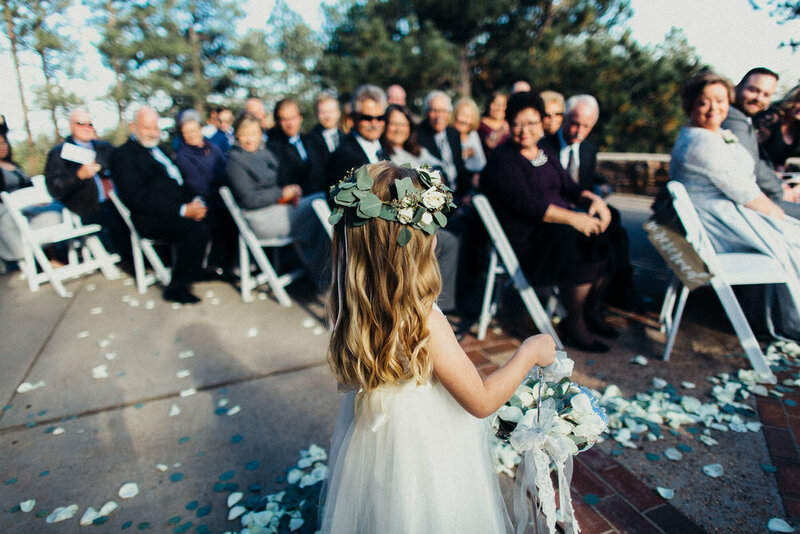 Together with baby's breath, the combination was a truly simple and elegant design perfect for a traditional summer wedding in the high peaks of Colorado. Maggie and Dan knew that location and logistics were going to eat up a large part of their already modest, less than $12k total budget. With the chapel located high in the Rockies outside of Estes Park, they decided on a reception venue in Lyons at Lionscrest Manor which fit not just the budget and elegant ambience they were looking for, but also offered another set of gorgeous mountain views since it is perched up high enough to glimpse Long's Peak at sunset. With family flying in from out of town, they decided on the Renaissance Flatiron hotel in Broomfield as a central location for the room block. 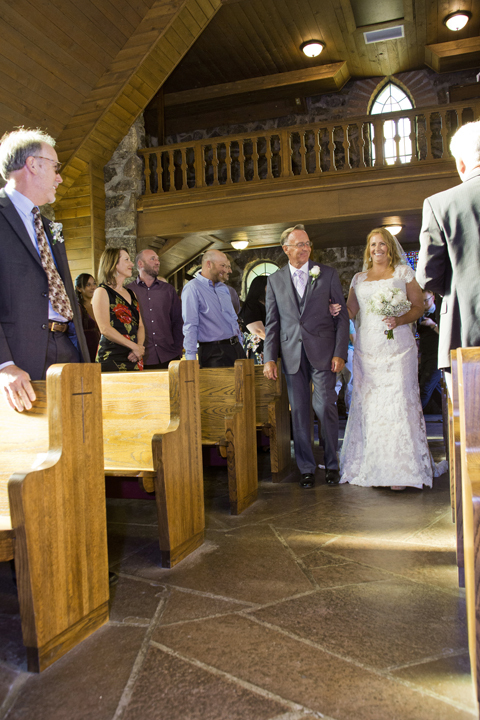 Given the steep and mountainous terrain to the chapel and reception, they knew that roundtrip shuttle service was an absolute must for their family and friends on the day of the wedding. They worked out a deal with the hotel for discounts on shuttle service based on the number of rooms booked, which almost cut the bill in half! Read more on accommodating out of town guests here! Like most families, Maggie and Dan's family appreciate good food! 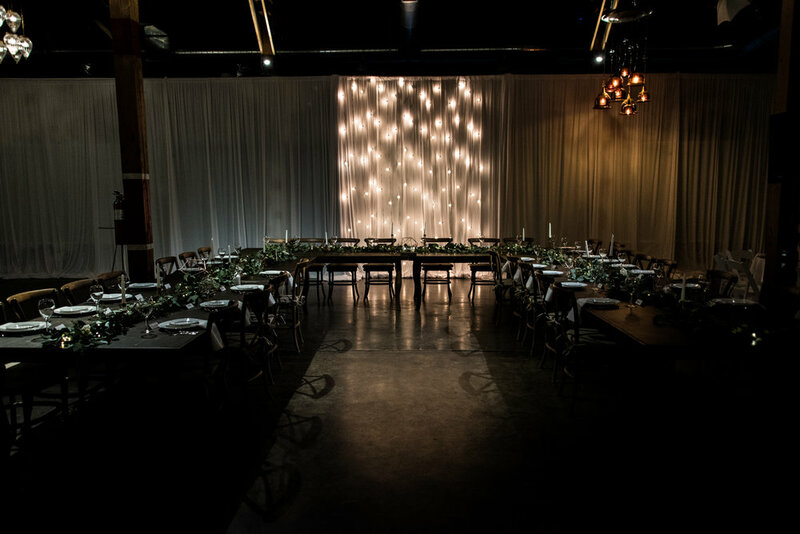 When it came to the catering service, they partnered with Front Range Catering who worked in a discount based on their double booking for the rehearsal dinner and wedding reception! Maggie and Dan chose to keep it budget-friendly with a buffet style dinner and nobody left hungry! Several appetizers including mini twice baked potatoes, petite quiche lorraine, and sesame coconut chicken skewers were served when guests arrived to the reception. A lighter main course of chicken roulades and stuffed tilapia as entrees, with a few rich sides including Dan's favorite penne Alfredo rounded out the menu. Maggie and Dan chose to have a small 6" cake, and guests were served table side from a more economical sheet cake, all baked by Front Range Catering! With a setting like this, Maggie and Dan knew that photography was going to be super important. 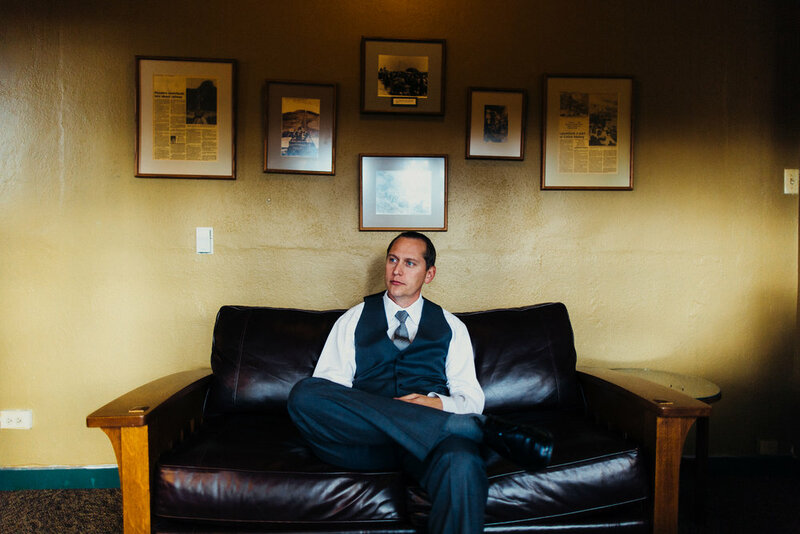 Jamie Striplin of Crystaline Photography fit the bill for them in terms of the GREAT package deal she offered, and the experience with epic mountain wedding photography that Jamie and her team brought to the table. Most importantly, Jamie and her team were almost invisible throughout the day, and executed on all of the very specific shots that Maggie and Dan had in mind. With over 2,000 gorgeous photos, this couple may never get around to selecting album photos and prints! As a musician, Dan was able to lock in a great deal with a fantastic band, "Jus' Sayin" who played the entire reception. Planning the entire wedding together, with help from Maggie's Mom, was time consuming but ultimately gave Maggie and Dan greater control over negotiating contracts, and finding deals on everything from the wedding dress to flowers to catering to decor. They wouldn't have done it any other way! The setting for this wedding was incredible; guests will remember the views and serene beauty of the historic chapel more than the centerpieces. 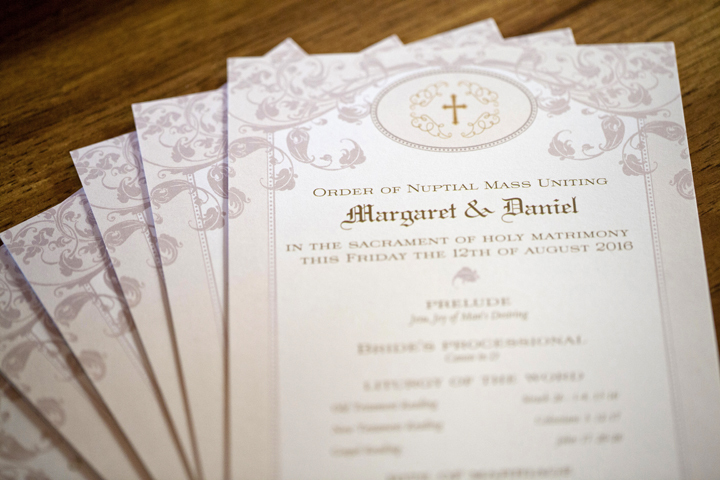 This really allowed Maggie and Dan to take advantage of the scene that was already set, incorporating fewer accents and decor than would have been required to dress up another church and venue at a different location. Maggie and Dan will never forget the moment their eyes met for the first time that day at the top of the aisle. That moment stood still for both of them before the rest of the day flew by! Budgeting was always top of mind for Maggie and Dan, so they found every way they could to cut costs. The reception venue and caterers both took payment installments which really helped to spread out the larger costs over more time. 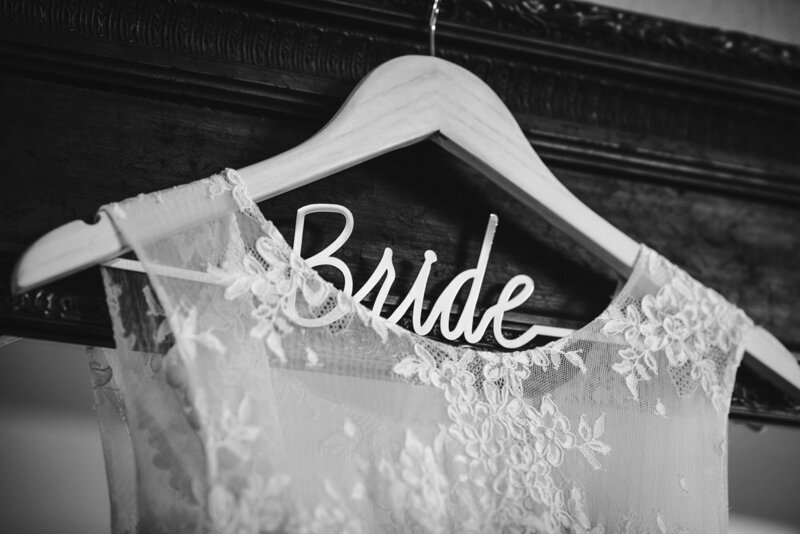 Costs were also a concern for our wedding party, so allowing them to all choose their own attire really alleviated any stress there and saved so much time in coordinating and shopping for those items. Maggie was knee deep in flowers creating all of the accent and centerpieces two days before the wedding, and Dan designed and created all of the invitations, mass cards, and signage. Due diligence is important. Take the time to research online before making a short list to actually meet with or visit in person including venues, caterers, vendors, prices, etc. Read reviews from other couples. There are plenty of sites that allow real couples to review their experiences. Choose those that are in the budget first, and have great reviews! Decide early on what you are willing to manage yourself and what you want to delegate to others or outsource to a planner. Remember there are trade-offs. Your time and sanity are super important during this time! If you are the type of person who enjoys having full control over every detail, then do most of it on your own! But if you have trouble making decisions, or feel overwhelmed at the prospect of where to start, meet with a few planners and decide if you want to take all or just some of the work off of your plate. First of all, enjoy the process and don't lose sight of what is important when planning a wedding! It was one of the most stressful, but ultimately rewarding times in our lives. When your wedding day finally arrives, enjoy it. One of the best suggestions we received before our wedding was, "Look around you and be thankful. There is likely never going to be another moment in your life when all of these most important people are in the same place, at the same time again." Struggles? None. Stress? Nah. How did Haley and Will pull this off on their wedding day? Two words: wedding planners. 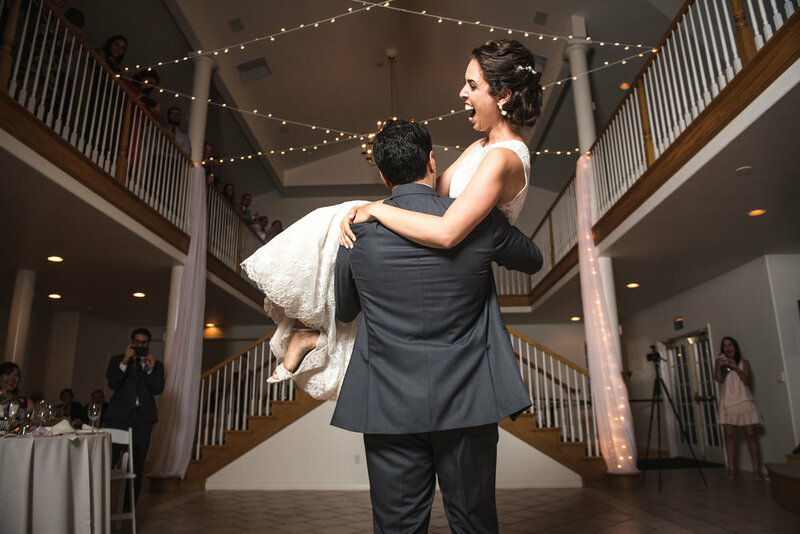 Haley and Will's wedding is a great example of what a big difference it makes to have a coordinator on your wedding day to absorb your stress and ensure everything goes smoothly for you. Read on to learn more from Haley! We met in college, then moved to Colorado Springs. We got engaged 4 years after we started dating. We got married a year and a half later on the best day ever. Mint is my favorite color and lavender was Will's mom's favorite color. We kept it simple with some color and ivories. Our budgeting was done by our AMAZING wedding planners, Lisa and Leslie, with Affair with Flair. The bridesmaids' bouquets were aisle decor that they picked up and put back before and after they walked down the isle. 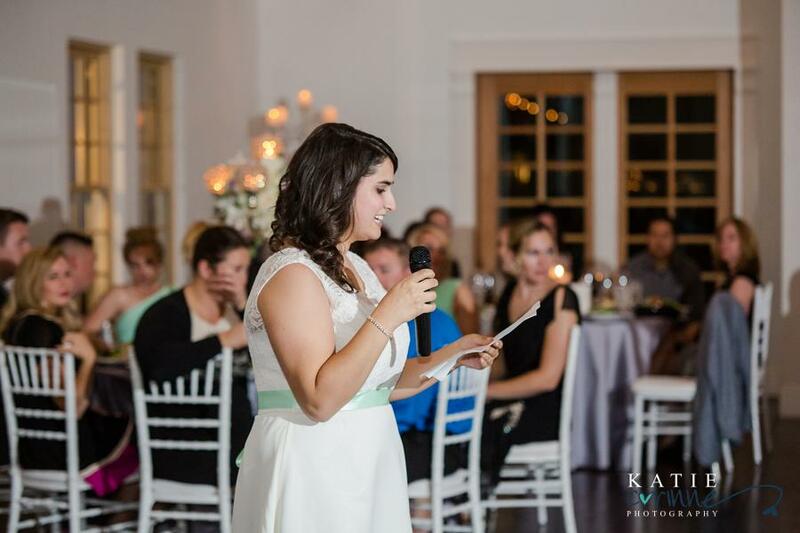 My maid-of-honor's speech. Simply THE BEST. There were no struggles. My wedding planners were amazing and helped keep to a timeline and they kept everything organized. I was very lucky. I believe everyone should have a wedding planner. They know so much about what you actually need to put on an amazing party you will never forget. Have fun with it. Give yourself enough time to plan. There is no need to rush forever. Stay happy. We have been very lucky that we are on the same page as far as kids, work, and travel go. We are happier than ever. 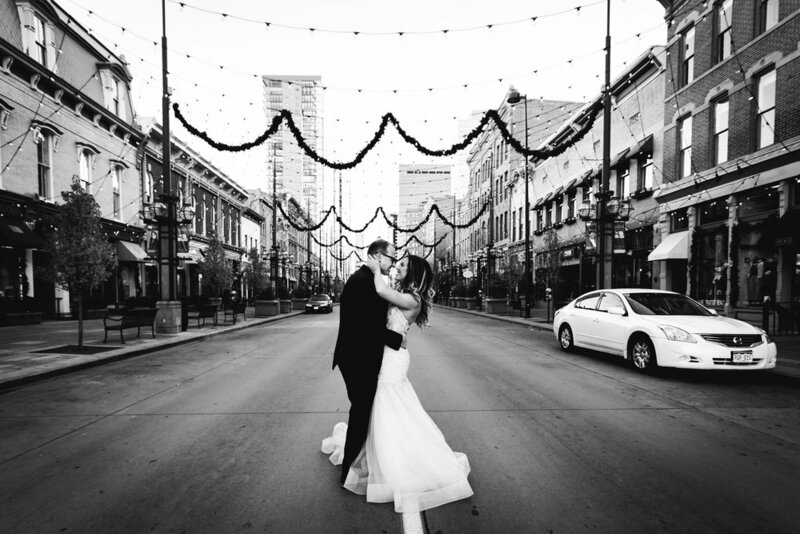 Who better to feature on a Colorado wedding blog than Miss Colorado 2014 herself! Stacey and Jeremy are a couple who prove beauty is about what's on the inside though. Their philosophy is that they need to love on each other every day, but it's easy to see they love others around them as well. Be sure to check out their incredibly thoughtful favors, which were truly gifts that keep on giving. Read on to learn more from Stacey! The beginning of this love story goes back to one moment on a cool fall evening. Jeremy was playing in a Friday night football game for our high school. After a tough fight, our team lost and Jeremy was heartbroken. He and I had only spoken a few times but on this evening we made eye contact across the field, gravitated toward each other, and the rest is history. After nine years together, Jeremy proposed on Christmas morning. I had always wanted a "rustic chic" wedding, but when Jeremy and I saw the Manor House, we knew that was where we wanted to get married. The building is historic and gorgeous; it looks like a plantation, perched perfectly in the foothills. We decided to go for a classic theme with romantic twists. I wanted the colors to be soft: champagne and blush, with metallic accents. Jeremy wanted to add a bold pop of navy and it turned out great! Jeremy and I identified the really important things up front, we decided we wanted a venue with a view, really good food, and an open bar. We prioritized these three things and cut back on costs in other areas. For example, I bought a sample gown and did several DIY decorations. One of my favorite details was our unique wedding favors. Jeremy and I wanted to give our guests the ability to give to others. Giving is the best feeling in the world, and there are so many people in need. So we created bags for our guests to keep in their car for when they see someone who is experiencing homelessness. The little bags contained socks, water, and snacks. Another detail I loved was having two of my best friends, who also happened to be Miss North Dakota and Miss Georgia, sing "A Thousand Years" as I walked down the aisle. Our dessert table was also unique, instead of one wedding cake we had a whole buffet of dessert goodies. Jeremy's mom and dad made chocolate cupcakes and my mom made gluten-free carrot cake. We also had cannolis, cookies, and an outdoor s'mores station. The manor house also had a separate bar area that made for a fun and unique wedding guest experience. We also had pictures of Jeremy and me from when we started dating next to our engagement photos. When Jeremy and I walked into the reception everyone was cheering. It was so fun to see all of our favorite people as excited as we were about our marriage. I also loved our ceremony. We chose to read each other letters and I felt that it made our ceremony personal, light-hearted, and romantic. Jeremy and I planned our wedding in three months. It was a challenge but we worked together and chose to focus on the important things. We didn't fuss over tiny details and we also worked to keep our wishes at the forefront of our decision making. We often joke that if we can plan a wedding together in three months that we can do anything. I wish I would have known that you can take people with you to the food tastings! Jeremy and I showed up and had no idea that we could have taken our parents along to help us decide between all the amazing choices we had. Invite who you really want to be there. This is your day! You should have the people present that you want to be part of your marriage. Also, don't second guess your decisions, it will drive you crazy. Enjoy every moment together. My father passed away a month before our wedding, he and my mom had the sweetest relationship and to lose him was devastating. You always hear that life is short, but losing my dad right before my wedding reminds Jeremy and I need to love on each other every day. Remember, that you are so lucky to share the special relationship you and your partner have and don't let bickering or arguments get in your way. From Houston to Denver to Singapore, this adventurous couple has committed to love each other in sickness and in health. Dave and Melissa's beautiful wedding features a delicious but super healthy meal, vintage and steampunk decor, and a tech savvy solution for guests who couldn't celebrate with them in person! Dave lived in Houston and Melissa lived in Denver when they met online. They spent several months getting to know each other by exchanging messages, sending emails, and video chatting. Finally, Dave decided that he absolutely had to meet this girl, so he purchased a plane ticket to Denver. Their long distance relationship continued on for some time. They flew to see each other as often as they could. The trips were never long enough or frequent enough, so Melissa took a chance on love and moved herself to Houston. While they were still enjoying the glow of their new permanence in each other’s lives, something completely unexpected and rather heartbreaking was discovered. A few months after arriving in Houston, Melissa was diagnosed with a rare and incurable autoimmune disease. Dave bore the news with compassion and fortitude, never wavering in his commitment to her. Dave and Melissa continued to build their lives together for several years. Marriage was often thought about and discussed, but Melissa didn't know Dave had picked out a ring or that a proposal was on its way. A few days before Christmas, Dave proposed to Melissa at her favorite restaurant. They were ready to not only plan a wedding, but a marriage. Next, we'll hand things off to Melissa to tell us about their big day! I was born in Colorado and moved back for college. Capital Hill and downtown were my stomping grounds, so it just seemed appropriate to have our wedding where Dave and I first met instead of in Houston. We wanted the theme to be simple and elegant. I'm a huge fan of vintage furniture and jewelry as a result of going to auctions all of the time with my mom when I was growing up. We chose to do our wedding in grayscale. Black and white is popular, but I found it a bit limiting and I love metallic colors tied in with the matte colors. Dave and I were lucky with wedding costs because I have a B.A. in Graphic Design from the Art Institute of Colorado and had picked up a lot of diverse tech skills at my job. I was able to design all of the save the date magnets, invitations, envelopes, RSVP cards, website, cupcake table signs, wedding party app signs and app setup, and html email announcements regarding the wedding day details. We kept our wedding party small, which was a huge help. We had always talked about a very small wedding and only had a maid-of-honor and best man at our side. With the size of the Clock Tower venue, it's good that we did! The things we splurged on were the food and cake because we are both very into fitness and nutrition. It was important for us to have good food that we could eat and food that our guests would enjoy. 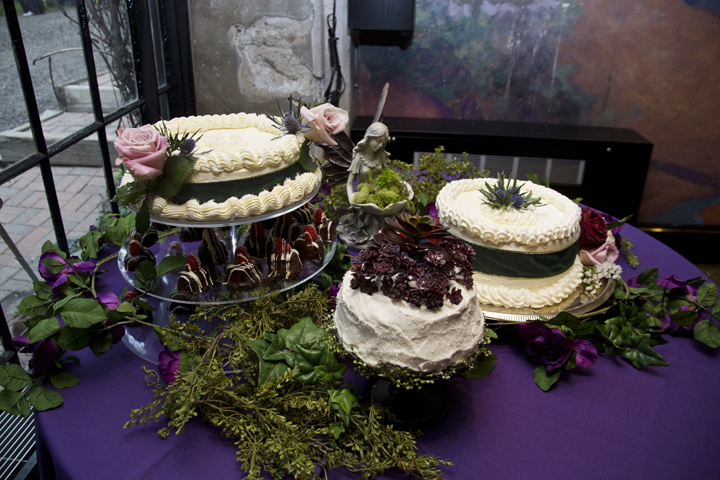 Bistro Boys Catering helped us out immensely with a Paleo menu and Azucar bakery provided us a Paleo cake with gluten free and regular cupcakes. The Clock Tower venue was a bit of a splurge too. We looked at doing our ceremony at one place and holding the reception elsewhere, but it was actually going to run us more with the venues we were looking at. They provided chairs, tables, and some decorations, and planning a wedding from Houston while we were both working full-time made this a no-brainer. Less things to have to source! The big commitment with the Clock Tower is that you do have to pay for it all up front. We decided not to go with a DJ because we knew the music we liked and had it all on our computers. It was easy enough to come up with a playlist and put it on an iPod because the Clock Tower had a sound system we could hook into. One of the workers there just had to hit play at the right time. No need for a videographer. I brought my laptop and we bought a 100 foot ethernet cable so I could plug it in directly to the internet so there'd be no streaming issues. I borrowed a camera, tripod, and microphone and set them up on my own right before the ceremony. Guests that couldn't make it could watch us get married live, and those that weren't available at the time could access the video any time after that on my YouTube account. My iMovie video skills allowed me to make the rehearsal dinner slideshow video, showing photos of Dave and me as a couple and as we were growing up. My mom found a very inexpensive florist with great reviews and we really didn't need a lot of flowers because the venue was already decorated with some nice fake ones. Flowers weren't a big deal for me, but they were for my mom. I could have gone with just bouquets for my sister and me. Photography was something worth splurging on. I have a design background and having taught Yearbook, I know pictures make the story. Pictures fill in that bit of the story you miss while you're getting ready and running around. Pictures are how you will see the guests you didn't get a lot of time with at the actual event. Pictures are what will trigger your memory years after the event has happened. Dave Camara was phenomenal. We booked him for our engagement photos as well. He's laid back and very professional with a creative eye. He'll get the standard shots, but he also gets ones you'd never think to frame how he has. I really wanted to get my dress from a consignment shop. I don't believe in splurging on something you're only going to wear once, and I planned to consign my dress after the wedding. I had some trouble booking a time at Marry Go Round (a bridal consignment shop in Houston) and we ended up at David's Bridal just to get a feel for what I had in mind. The only issue is that I tried on a dress that was perfect and it was $1000. I said I only wanted to spend half of that at most. Peer pressure won out. I don't regret it, and still plan to consign that dress. 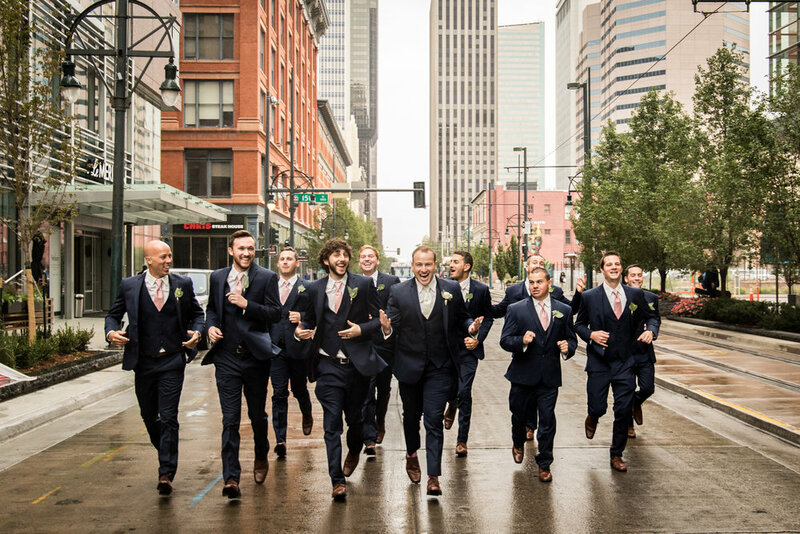 Dave and his best man rented tuxes from Men's Wearhouse. It was easy because we were in Houston and he was in Raleigh, North Carolina, and they have stores in both areas. I chose 3 Little Birds Salon due to location, affordability, and reviews. We were traveling from Houston to Denver for our wedding and I was relying on family to get me where I needed to be since Dave had the rental car. They did a great job and nailed the more vintage hair style I was going for with the pin curls. I'm very low-maintenance and wanted to look like me for my wedding. I did a test run with the salon, but my sister ended up doing my makeup just because I wanted a very understated look. Free definitely wasn't a bad price. We didn't do a registry and chose to use honeyfund.com to help pay for our honeymoon instead. It didn't make sense to gather a bunch of things we'd just have to pack that might not work once we headed to Singapore. I pooled my resources of friends and family to make some of the details come together that would have normally ended up costing me a lot more. One of my best friends and college roommate officiated the wedding for us. It was so much more personal and again, didn't cost us a dime. Meagan is a pro and I recommend her to anyone who is looking for a ceremony that is a bit less traditional. We did our save the date magnets using vistaprint.com. They were definitely the cheapest and most reliable print vendor and I've been using them for a long time. I designed the graphics for the envelopes and made separate files with every recipient's unique address. We printed those at home and used the same files to print on the pearl, off white envelopes we sent out with our formal invitations. I also designed our wedding invitations in Adobe Illustrator, tying in steampunk elements to match our venue. I bought clock parts on eBay and in Hobby Lobby, and we spray painted them silver on brown packing paper in the garage. I glued a couple of gears onto the invites along with two hands on a clock that showed the time our ceremony was to be. I also found silver paper doilies that I used to help add a vintage feel to the invitations, and then we glued silver/black ribbon to the cards and tied them. They were very labor intensive, but we sent out less than 100, so it only took a few days of long hours to get them done. I designed the RSVP cards to match the custom wedding invitations and had them printed by vistaprint.com as well. They always have sales running for business cards, so that's the size I made them. Rather than doing a pre-stamped and addressed envelope, we only provided our phone number or website to RSVP in order to save some money. In the end, was all of the stationary cheap? No. Were they cheap for highly custom and intricate designed invitations? Yes. I priced them out and I think I would have paid about $12-15 each for them if I had outsourced them. Thank heavens for Hobby Lobby sales and some ingenuity. If you know Dave and I well, you know we love to laugh. I had gone down the the 14th floor to use the restroom and just happened to catch Dave walking out. He left the toilet seat up! Dave Camara, our photographer, just happened to be there and captured the moment. It was so funny and out of the norm. I found it really difficult to try to plan a wedding in a different city and wrap up the school year as a teacher. Not only that, we were moving to Singapore less than two weeks after our wedding. We used Google spreadsheets to keep ourselves organized and we were able to share the sheets with our parents and anyone else involved. We had tabs for the guest list, vendors, budget, invitations, RSVPs and thank you notes. It was really helpful and I still use that document as my address book for family and friends. Thank heavens for email. Otherwise, I don't think anything would have been planned! We also had a challenge with our venue because I have elderly aunts and uncles who wouldn't be able to walk up the stairs from the 17th to 21st floor of the clock tower. We discussed so many options and nearly changed our venue. Ultimately, we came down to the solution that we could live stream the ceremony on the 18th floor to the 17th floor where tables would be set up for those relatives. The caterer would be on the 17th floor and would make special plates of food for our guests. The restrooms were also on this floor, so I knew they'd see all of the guests and there'd be no problem with everyone mingling and being involved. I was so stressed out, but none of those guests RSVP'ed yes or showed up. It was all for nothing. But, we were ready! I wish I would have known how much it would all cost. You start out thinking you're going to put on this great event on a crazy small budget, and there are some things that just won't meet your ideals unless you're willing to fork over the money for those things (ie - venues, etc). Then you realize that the venue doesn't matter. The decorations don't matter. Very few of those details really matter. The people you are sharing this event with matter. It wouldn't matter if it was potluck in your parents back yard. Don't stress. It's not worth it. Start early. Don't stress out because some of those small details won't make a bit of difference on your big day. Ask for help! Now that you're married, what marriage advice would you share with other couples? : Communication and laughter are our tricks to success. There was a point in time that Dave and I read The 5 Love Languages by Gary Chapman, and it has come in handy so many times. It talks about 5 different ways people feel loved, and those ways can change over time. Communicating these with each other has made a world of difference in our relationship.